If you grew up in New England, chances are high that an invisible woman worked in your family kitchen. She traveled in a well-worn book that was never far from your mother’s side. And her name was a familiar one — Fannie Farmer, creator of the “Boston Cooking School Cook Book,” first published in 1896. Farmer, whose name remains a New England byword, was one in a long line of lively and thoughtful cooks who created books to pass on their considerable skills and advice. 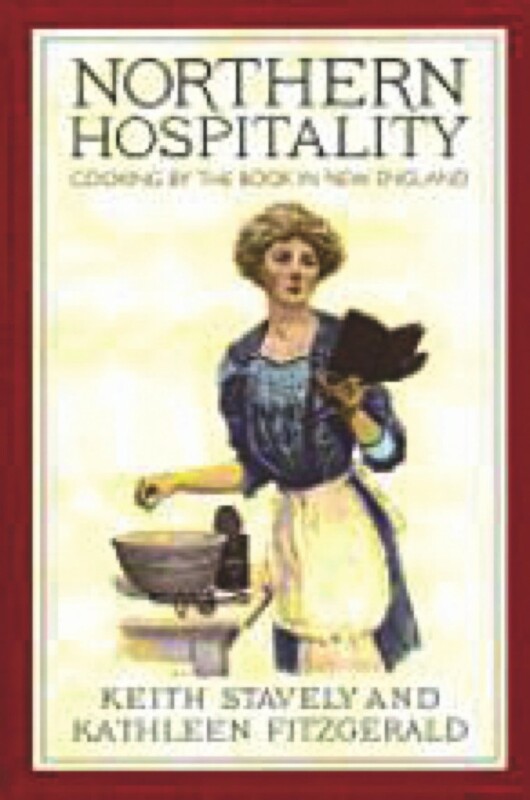 Now they stir, boil and bake again in a fascinating new book, “Northern Hospitality,” subtitled “Cooking by the Book in New England,” by author-librarians Keith Stavely and Kathleen Fitzgerald. The first American cookbook made its appearance in 1796. Until then, women who could read and aspired to more than stews around the clock looked for help to books published primarily in England. Even at that, cooking was only one part of the larger picture of household management, and a fairly minor part at that. The primary purpose was to help women run households free of hardships that plagued less fortunate homes. “The Number of Receipts in this book are not so numerous as some others, but they are what will be found useful and sufficient for any Gentleman’s Family,” declared English cookbook author Elizabeth Raffald in the late 18th century. Raffald’s use of the word “receipts” rather than “recipes,” by the way, brought back welcome memories for me, as my grandmother practiced the same usage in a lifetime lived through much of the 20th century. As Stavely and Fitzgerald remind us, “The point is not that the book is small but that it is properly proportioned, like the cookery that it makes available and the genteel way of life that it enables.” Even with low rates of literacy for women, the books were important to the lives they touched. Fannie Farmer broadened and added to that importance by emphasizing standardized measures and procedures that enable her recipes to continue to thrive today. There’s a nice kitchen coziness in that recipe but, as anyone who cooks can sense, there’s also room for error enough to make the difference between gravy and library paste. Looking back through the recipes and techniques recounted in these cookbooks reminds us that history does record progress that may not be so dramatic as space flights and social networks but accounts for real and welcome change nonetheless. Compare that for ease and accuracy to a modern standardized recipe for apple crumble or apple crisp. Progress is what dribbles down your chin.